Oh hi there! In case you’ve wondered, I just needed a short blogging/sewing break to get my little “blooming poppies” off to their first days of school and I, had some adjustments to make as well. Sending my youngest off to a four day a week school schedule definitely marked the end of a profound phase in my life and theirs. It feels a bit odd now, suddenly having all(relative term) this time without children in my midst. I took a few days to ponder my new freedom and, I must admit, shed a few tears. As I make my way through figuring out my new rhythm, I decided a good run, and a good quilting session would help me get some clarity. Well, the running was good, the quilting had it’s moments, but overall, was kind of a drag!! 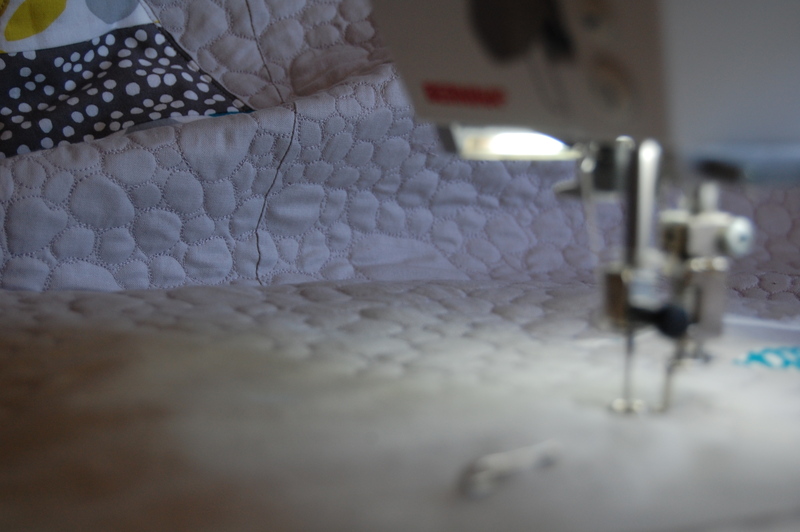 This pebble quilting thing, which I started a ways back, is just WAY too time consuming for my liking! I must admit, there are moments with it, where I feel like I hit my stride and I am in a good “groove” but mostly it is just tedious, hard and a literal pain in the neck…… hmmm, kind of like running sometimes!! The pay off always seems worth it in both cases for me….. Anyway, I realize that maybe this type of quilting is best left for smaller, fill-in spaces on a quilt and I chose to fill in a huge mass of negative space here, which has made it a much longer and more intensive process. On the bright side however, I’m almost finished and I’ve improved greatly on a quilting skill that was brand new to me!!! I’m happy to say I’ll be moving on from this quilt soon, as I have several projects lined up waiting for some attention. My babies are 32 and 28, with babies of their own and I still miss them sometimes. Oh I can still remember those tears as both kids left for school and it’s been years. 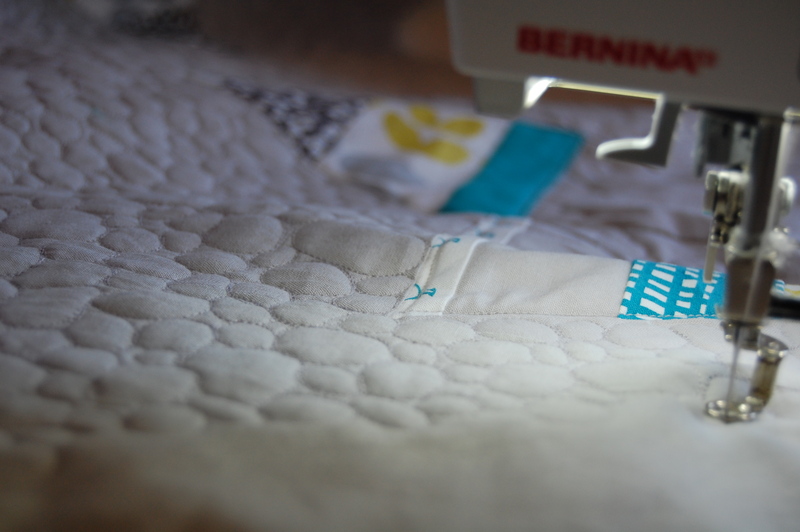 Your pebble quilting looks great even if it was tedious. Haven’t tried it yet myself. It’s definitely a time of adjustment as your poppies bloom ever more… a grand journey in all. Finding time to feel what you’re feeling and “listen” to the voice within that tells you what comes next is so important. Good for you, Karen, for making the time. Love your pebbles, can totally see how doing it in such a large area could be crazy-making. I do hope to one day try it on a small space somewhere. Thanks for yet more inspiration! I love your pebbles! I’ve tried them on smaller pieces and love the look but like you said, so much work! Thnanks! Yes, I think your decision to do them in a small space was quite wise! it’s looks so fabulous, but i’m not sure i have the stamina for it!!! 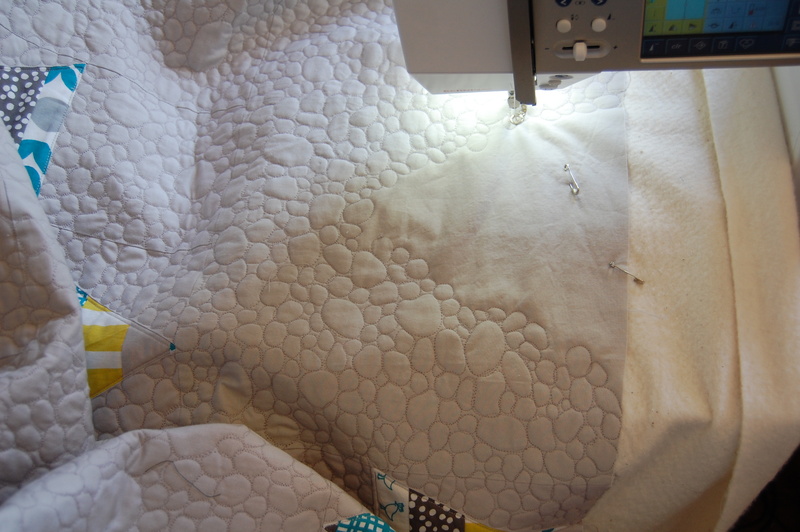 That is pebble quilting looks laborious! I’ve been thinking of doing the same thing with a large negative space, but have been talking myself out of it for the same reasons you listed. I may try it on a smaller scale though. I’m sure this quilt is going to have amazing texture. So maybe it’s worth the effort?